In Ukrainian tradition a rooster symbolizes happiness and wealth, men's health. Two birds sitting face to face mean newlyweds, a tree between them is a symbol of a new family. This bracelet is loomed of 3 bead colours: black, red and white. Two variants of the bracelet are civen in the pattern: a short one with only one tree between the roosters and a long one with three trees (shown in the photo). This ornament can also be used for brlts, for it's quite wide, 8 cm. 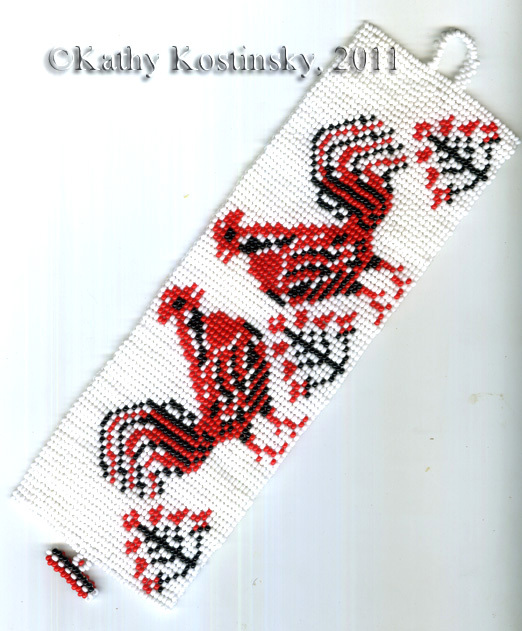 The pattern includes a photo of the finished bracelet, 9 graphs (of both variants of the bracelet and the clasp) and a detailed instruction for the clasp. The rows are numbered.